(STILLWATER, OKLA. / Nov. 5, 2009) –– The Stillwater Public Library and Monty Harper, a local family entertainer and science enthusiast, are pleased to announce a fun, new program called "Born to Do Science" for area children. This monthly program, intended for third through fifth graders, allows kids to speak directly with working scientists and to see first-hand how the process of science works. "My goal is to give kids a chance to talk to real working scientists about their research," said Harper. "I want kids to come away feeling that they talked to a scientist who's doing important work and I want them to picture themselves doing similar work in their own lives." The series will be presented on the third Thursday of each month, except March, at 6 p.m. in Room 119 and will include interactive presentations by local scientists, fun and wacky science songs by Harper, and hands-on activities. "These programs are more interactive than just listening to a talk or presentation," said Harper. "The audience has an important roll to play." The first program is "Cultivating Super Wheat" on Thursday, Nov. 19 and features geneticist Cheryl Baker, U.S. Department of Agriculture. Baker will explain how her groundbreaking research on wheat varieties led to their natural resistance to pests such as Russian aphids. The series continues on Thursday, Dec. 17 with Dr. Marianna Patrauchan, OSU assistant professor in microbiology and molecular genetics. Patrauchan will present "Breaking Up Bad Bacterial Biofilms" and speak about her research on biofilm, a group of microorganisms surrounded by the slime they secrete. She will also explain how her research on these slippery slime cities may one day lead to a cure for cystic fibrosis. Additional programs will be scheduled for 2010. 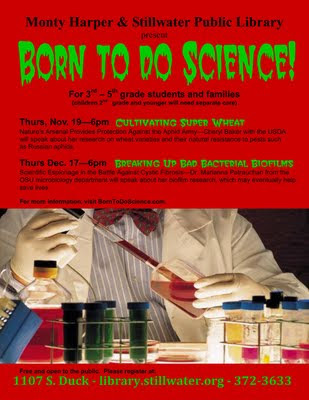 Registration for each program in "Born to Do Science" series is required. The registration deadline is one week prior to each program. Participants are limited to third through fifth graders and their families. Parents are asked to make separate child care arrangements for family members in second grade or younger. For more information, visit the library's web site at library.stillwater.org, contact the library Help Desk at 405-372-3633 or email askalibrarian@stillwater.org or visit www.BornToDoScience.com. The Stillwater Public Library is located at 1107 S. Duck St. (the corner of Duck and 12th Ave.). Library hours are Monday-Thursday, 9 a.m. to 9 p.m.; Friday and Saturday, 9 a.m. to 6 p.m.; and Sunday 1 p.m. to 5 p.m. This event is co-sponsored by KOSU.